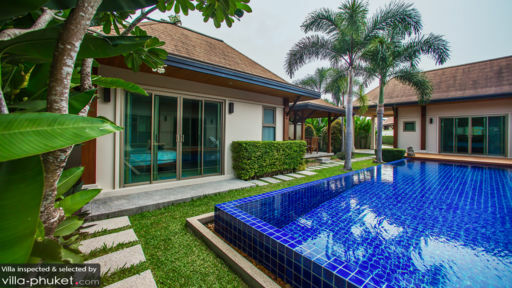 Located near Nai Harn Beach, Villa Haimona is a three bedroom getaway. 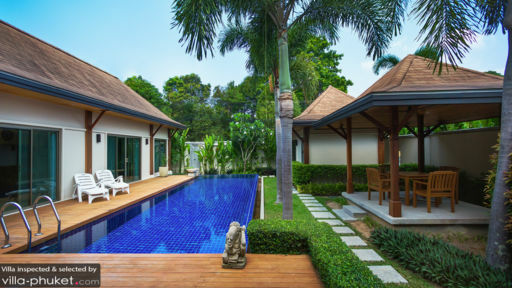 With a beautiful 10 meter swimming pool in a vivid green garden, spacious rooms, and a relaxing open plan living space, Villa Haimona is where families can unwind and reconnect. 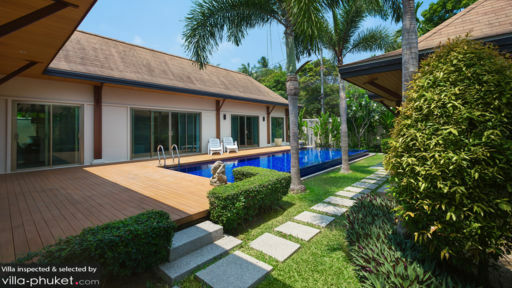 Coupled with friendly service and a private yet convenient location near some of Phuket’s beaches and a number of restaurants, you are sure to have a memory holiday here at Villa Haimona. There are three guest bedrooms here at Villa Haimona. Each room has a plush king size bed where you can be sure you will get a good night’s sleep. The rooms also have personal safes and air conditioning units. Two of the rooms also have en suite bathrooms. Your day will not be complete if you don’t spend some time in the villa’s outdoor and pool area. In the midst of the lush green plants, trees, and shrubs peppered throughout the garden is an enticing blue-tiled 10 meter swimming pool. Here you can take some easy laps or simply enjoy the feel of the water on a hot afternoon. If you just want to get some sun, there are two lounge chairs on the pool deck where you can lay back and read a book. The garden also has an outdoor dining area where you can take some snacks before jumping into the pool again. In the evenings, you can have a relaxing candlelight dinner with your family. Imagine lying back on a comfortable L-shaped couch in a bright open-plan living space, with a gorgeous view of the garden and pool area. You can do this everyday in the villa’s lounge area. The space is even equipped with a pop-up LCD TV. You can have a movie night with your family and friends, whilst munching on some delicious popcorn made in the fully equipped kitchen. Before you watch a movie though, it’s always best to have a satisfying dinner. You can eat in the dining area, which is in between the kitchen and lounge areas. It has a sturdy wooden dining table and it seats six people. The staff here at Villa Haimona are friendly and want to help make your holiday enjoyable for you and your family. There is WIFI in the villa, which makes creating an itinerary for your stay very easy. However, should you like some more recommendations of what to do and where to go, the staff will be ready to assist you. There is 24/7 phone support should you have any concerns. Lastly, housekeeping will come in and make sure the spaces stay tidy during your entire stay. One of the best parts of staying at Villa Haimona is that you are a 3 minute drive away from feeling sand between your toes and saltwater in your hair at Nai Harn Beach. The beach is relatively popular amongst locals with only a handful of hotels and restaurants nearby. You can have drinks and watch the sunset on the beach or in one of the restaurants. There are also a number of other beaches roughly 6 kilometers away from the villa: Kata Noi Beach and Kata Beach. However, you can already do quite a lot near the villa itself. There are a number of restaurants, offering various cuisines, within 3 minutes walking distance away. There are also other establishments within 600 meters of the villa, including a convenience store, gym, and massage place.